Shown (L-R) are Florence's grandchildren: Jack, Cole, Leah and Sara. Behind them is MacLauglin’s son, Jason, and his wife, Christine. Members of the Bellingham Fire Department shown at the bench-dedication ceremony (L-R) are Chief Steve Gentile, Deputy Chief Mark Poirier, Captain Joe Robidoux, Joe Manning, Lieutenant Greg Prew and Bethany Cloutier. A ceremony was held on April 29 to honor the late Florence MacLaughlin, who served Bellingham for 30 years as Assistant Town Clerk. A bench in her memory was dedicated and her family was on hand for the ceremony. 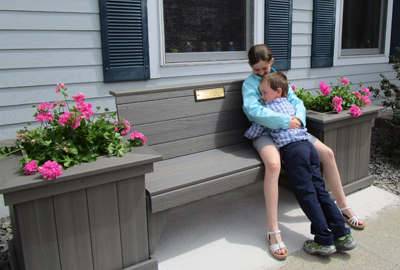 It didn’t take long at the dedication ceremony for two of Florence’s grandchildren, (left) Leah and Cole, to comfort one another on the memorial bench.